Slip-on holster for smaller thirst quenchers! The cup holder is designed to attach to your 2010 buggy with cup holder locator. Fits with the Phil & Teds Classic and Explorer buggy. I love the idea of this but find it also gets in the way - I have a mountain buggy duet which is the same width as a single stroller and find it gets caught on the doors. It attaches easily which also means it falls off easily, would be nice to have a more secure attachment. NO issue holding my coffee which is uber important for a busy mom of a 4 year old and 11 month old twins! I originally bought this because the reviews were very negative for the other cup holder attachment. However, I do not like this. It doesn't hold any of the cups I generally take with me, I find I hardly use it. I generally use the pockets on the sun shade instead. I wish that it was a little smaller and it attached more securely to the stroller. Easy to attach on the stroller, but moves when strolling. It doesn't hold travel mugs or bottles very well. It's a great addition to my stroller. The only downside is it easily comes off in my car and I've left without it at times. 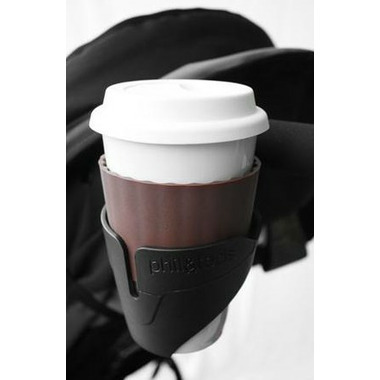 Didn't know how it worked, but you just basically snap it on to the side screw on my mountain buggy and it worked, Phil's and teds and mountain buggy are somewhat the same company, I love this product, holds my coffee cup, MEC water bottle really well. Not great, not sure what it is supposed to hold? It tips and moves with the buggy. Not great for a water bottle even. Works ok for holding keys and other items... Looks nice though! it's a sturdy cup and good size but it would have been better if it had come with the bits to screw it in.